Bronchoplastic techniques can also be used to repair traumatic airway injuries and benign strictures. Surgical bronchoplasty involves reconstruction or anastomosis of bronchus after lung procedures such as lobectomy, sleeve resection, wedge resection, and pulmonary artery angioplasty. In its most common form, this procedure involves resection of a portion of the airway without resection of the associated lung parenchyma and reconstruction of the airway with bronchial anastomosis (sleeve resection). The typical scenario is a centrally located upper lobe lung cancer involving the origin of the right upper lobe bronchus and the origin of the bronchus intermedius. Without use of bronchoplastic techniques, a pneumonectomy would be required, but a right upper lobectomy may be performed with the resection extending to involve the proximal bronchus intermedius and reanastomosis of the right mainstem bronchus to the bronchus intermedius, thus preserving the right lower lobe. Tumors involving the main branches of the pulmonary artery can similarly be resected with pulmonary artery sleeve resection and reanastomosis. Balloon bronchoplasty involves the use of balloons for symptomatic airway stenosis. Balloon bronchoplasty is a procedure essential to practice of interventional bronchoscopy. It is performed with both flexible and rigid bronchoscopy. This technique is generally used in conjunction with other techniques (eg, electrocautery, stent deployment). Bronchoplasty is indicated for various benign and malignant pulmonary lesions. Surgical bronchoplasties are commonly performed in conjunction with lobectomy, wedge resection, and sleeve resection. Balloon bronchoplasty is indicated in central airway obstructive lesions resulting in endoluminal stenosis due to endobronchial carcinoids, sarcoidosis, hamartoma, bronchogenic carcinoma, infections, Wegener granulomatosis, postintubation stenosis, idiopathic or posttraumatic stenosis, granulation tissue, and bronchial strictures after lung transplantation. Bronchial thermoplasty is used for treatment of patients with symptomatic severe, persistent asthma who are 18 years and older. Balloon bronchoplasty is generally safe, but complications such as chest pain, bronchospasm, airway rupture, pneumothorax, hemothorax, and mediastinitis are possible. Late complications include recurrent stenosis and stent displacement. Complications associated with thermal bronchoplasty include a transient and self-limited increase and worsening of respiratory symptoms, atelectasis, hemoptysis, anxiety, headaches, and nausea. Raphael Bueno, MD, John C. Wain, MD, Cameron D. Wright, MD. Bronchoplasty in the Management of Low-Grade Airway Neoplasms and Benign Bronchial Stenoses. Ann Thorac Surg. 1996;62:824-828:[Medline]. Anjum Jalal, K. Jeyasingham. Bronchoplasty for malignant and benign conditions: a retrospectivestudy of 44 cases. European Journal of Cardio-thoracic Surgery. 2000; 370-376:[Full Text]. Nagayasu T, Yamasaki N, Tsuchiya T, Matsumoto K, Miyazaki T, Hatachi G, et al. The evolution of bronchoplasty and broncho-angioplasty as treatments for lung cancer: evaluation of 30 years of data from a single institution. Eur J Cardiothorac Surg. 2016 Jan. 49 (1):300-6. [Medline]. Cayetano KS, Chan AL, Albertson TE, Yoneda KY. Bronchial Thermoplasty: A New Treatment Paradigm for Severe Persistent Asthma. Clin Rev Allergy Immunol. 2011 Nov 22:[Medline]. Kozo Nakanishi, MD, PhD*. Video-Assisted Thoracic Surgery Lobectomy With Bronchoplasty for Lung Cancer: Initial Experience and Techniques. Ann Thorac Surg. 2007;84:191-195:[Medline]. Whitson BA, Andrade RS, Boettcher A, Bardales R, Kratzke RA, Dahlberg PS, et al. Video-assisted thoracoscopic surgery is more favorable than thoracotomy for resection of clinical stage I non-small cell lung cancer. Ann Thorac Surg. 2007 Jun;83(6):1965-70:[Medline]. Marcus Kru¨ger*, Klaus Uschinsky, Kathrin Ha¨ßler, Claus Engelmann. Postoperative complications after bronchoplastic procedures in thetreatment of bronchial malignancies. European Journal of Cardio-thoracic Surgery 14 (1998) 46–53. [Full Text]. Adelheid End, MDa, Peter Hollaus, MDb, Andreas Pentsch, MDa, et al. Bronchoplastic procedures in malignant and nonmalignant diseaseMultivariable analysis of 144 cases. J Thorac Cardiovasc Surg. 2000;120:119-127:[Full Text]. Eung-Sirk Lee, Seung-Il Park, Yong Hee Kim, Chi Hoon Bae, Hye Won Moon, Mi Sun Chun, et al. Comparison of Operative Mortality and Complications between Bronchoplastic Lobectomy and Pneumonectomy in Lung Cancer Patients. J Korean Med Sci. 2007 February; 22(1): 43–47:[Medline]. Ph. Icard, J.F. Regnard*, L. Guibert, P. Magdeleinat, B. Jauffret, Ph. Levasseur. Survival and prognostic factors in patients undergoing parenchymal savingbronchoplastic operation for primary lung cancer:a series of 110 consecutive cases. European Journal of Cardio-thoracic Surgery 15. (1999) 426–432:[Full Text]. Onaitis MW, Furnary AP, Kosinski AS, Kim S, Boffa D, Tong BC, et al. Prediction of Long-Term Survival After Lung Cancer Surgery for Elderly Patients in The Society of Thoracic Surgeons General Thoracic Surgery Database. Ann Thorac Surg. 2018 Jan. 105 (1):309-316. [Medline]. [Full Text]. Deslauriers J, Tronc F, Grégoire J. History and current status of bronchoplastic surgery for lung cancer. Gen Thorac Cardiovasc Surg. 2009 Jan;57(1):3-9. [Medline]. Francis D. Sheski, MD; and Praveen N. Mathur, MBBS, FCCP. 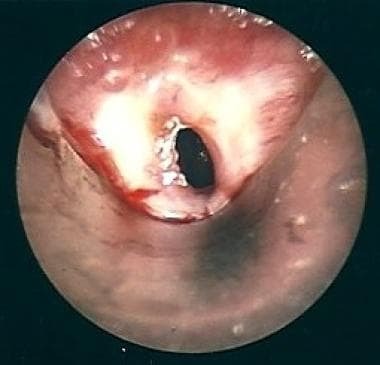 Long-term Results of FiberopticBronchoscopic Balloon Dilation in theManagement of BenignTracheobronchial Stenosis. [Full Text]. Tedder M, Anstadt MP, Tedder SD, Lowe JE. Current morbidity, mortality, and survival after bronchoplastic procedures for malignancy. Ann Thorac Surg. 1992 Aug;54(2):387-91.:[Medline]. Kocher GJ, Gioutsos KP, Ahler M, Funke-Chambour M, Ott SR, Dorn P, et al. Perioperative Lung Function Monitoring for Anatomic Lung Resections. Ann Thorac Surg. 2017 Nov. 104 (5):1725-1732. [Medline]. [Full Text]. Christophoros Kotoulas, George Lazopoulos. Wedge resection of the bronchus: an alternative bronchoplastic technique for preservation of lung tissue. European Journal of Cardio-thoracic Surgery 20 (2001) 679–683. [Full Text]. Laursen LØ, Petersen RH, Hansen HJ, Jensen TK, Ravn J, Konge L. Video-assisted thoracoscopic surgery lobectomy for lung cancer is associated with a lower 30-day morbidity compared with lobectomy by thoracotomy. Eur J Cardiothorac Surg. 2016 Mar. 49 (3):870-5. [Medline]. [Full Text]. Bendixen M, Jørgensen OD, Kronborg C, Andersen C, Licht PB. Postoperative pain and quality of life after lobectomy via video-assisted thoracoscopic surgery or anterolateral thoracotomy for early stage lung cancer: a randomised controlled trial. Lancet Oncol. 2016 Jun. 17 (6):836-844. [Medline]. Agasthian T. Video-assisted thoracoscopic bronchoplasty. J Vis Surg. 2017. 3:12. [Medline]. Sandra C. Tomaszek, MD, Stephen D. Cassivi, MD, MSc, K. Robert Shen, et al. Clinical Outcomes of Video-Assisted Thoracoscopic Lobectomy. Mayo Clin Proc. 2009 June; 84(6): 509–513. [Medline]. Kamiyoshihara M, Nagashima T, Igai H, Atsumi J, Ibe T, Kakegawa S, et al. Video-assisted thoracic lobectomy with bronchoplasty for lung cancer, with special reference to methodology. Interact Cardiovasc Thorac Surg. 2011 Apr;12(4):534-8. [Medline]. [Guideline] C.T. Bolliger, P.N. Mathur. ERS/ATS statement on interventional pulmonology. ERJ February 1, 2002 vol. 19 no. 2 356-373. [Full Text]. Orons PD, Amesur NB, Dauber JH, Zajko AB, Keenan RJ, Iacono AT. Balloon dilation and endobronchial stent placement for bronchial strictures after lung transplantation. J Vasc Interv Radiol. 2000 Jan;11(1):89-99. [Medline]. Amesur NB, Orons PD, Iacono AT. Interventional techniques in the management of airway complications following lung transplantation. Semin Intervent Radiol. 2004 Dec;21(4):283-95. [Medline]. Mario Castro1, Adalberto S. Rubin2, Michel Laviolette3. Effectiveness and Safety of Bronchial Thermoplasty in the Treatment of Severe AsthmaA Multicenter, Randomized, Double-Blind, Sham-Controlled Clinical Trial. Am J Respir Crit Care Med Vol 181. pp 116–124, 2010. [Full Text]. Gerard Cox, M.B., Neil C. Thomson, M.D.,. Asthma Control during the Yearafter Bronchial Thermoplasty. [Full Text]. Lowe JE, Bridgman AH, Sabiston DC Jr. The role of bronchoplastic procedures in the surgical management of benign and malignant pulmonary lesions. J Thorac Cardiovasc Surg. 1982 Feb;83(2):227-34.:[Medline]. Torrego A, Solà I, Munoz AM, et al. Bronchial thermoplasty for moderate or severe persistent asthma in adults. Cochrane Database Syst Rev. 2014 Mar 3. 3:CD009910. [Medline]. Alair catheter deployed in the subsegmental bronchus.